When you hear that something or other is considered to be infamous, then you would reasonably expect it to be bad…famously bad. If there is one movie in the original X-Men trilogy to be considered infamous, it would be the third film. I disagree, and I’d tell you why in this introduction paragraph if I could, but it’s not that simple. I actually love this movie, and out of the trilogy, this is seriously my favorite one. It’s not the best all around, but it’s definitely the one I want to see the most if say, they were all playing simultaneously on TV and had to make a choice. Throughout this review I’ll try to make you understand why I think X-Men: The Last Stand was surely underrated. After the events of X2, magneto is still at large, and the U.S. government is working hard at finding him, interrogating the recently arrested Mystique. Hank McCoy, aka The Beast also works with the Government and is aiding their efforts. Meanwhile, Alcatraz Island is the home of a group of scientists have created what they call a “cure” for mutants, even though most mutants wouldn’t consider themselves disease-ridden – but Rogue gains interest when she grows weary of being unable to kiss Bobby aka Iceman. Meanwhile, Jean Grey is back as the Phoenix, a wildly powerful and uncontrollable mutant that is unable to think clearly. This all adds up to an incredibly epic end battle, wrapping everything up. Before I go into the arguments between why this movie is better than what everyone says, I want to first say why it fits with the rest of the series. The first film was all about society’s acceptance of the mutants, the second was about family’s acceptance, and this one was about self-acceptance. These are all themes introduced in the films, however briefly, and if I’m not mistaken – that’s every type of acceptance. Someone was thinking with the previous films in mind. Also, Jean Grey’s power was hinted at mostly in the second film, but from the beginning, you knew she was special. Now onto the good stuff…the arguments. Too cluttered: Some would argue that there are simply too many storylines going on at once. There’s the stuff with Warren and his father, Rogue and Bobby, Wolverine and Phoenix, Magneto and Phoenix, the Cure…all that. You forget though, that all of it fits together – the two main stories is just the cure and the Phoenix, which also fit together. I’m not one to always understand a story, and can usually tell when a film is cluttered, but I can understand this film completely. Ignored character development: The previous films had this…quirky, sarcastic and playful way that the characters acted alongside each other, and a lot of people would argue that everything that was introduced in the other films was ignored here. Maybe a little, but the same can almost be said for Iron Man 3, it’s just…franchises get darker to the end to boost that feeling of epicness and seriousness. It’s needed, so this didn’t bother me in the least bit. We were also introduced to new mutants like the Beast, Angel, and Juggernaut (along others)…there was nothing wrong with character development. Made just for the visuals: I will agree that the movie looked phenomenal. 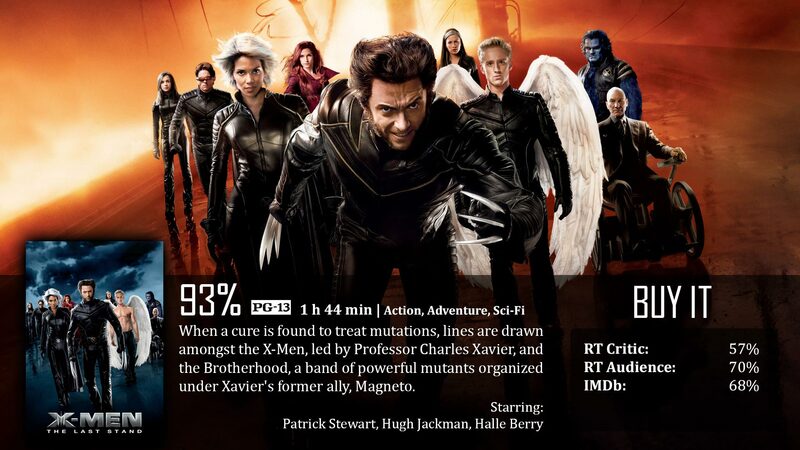 It’s one of the best-looking X-Men movies out there in a lot of different ways. However, what I will also say is that there was a lot more story than people give it credit for. I love this movie so much that after it was released, I bought the official movie novelization of the film. That says something right there. I wanted to experience the movie a different way. People may hate me for my review, but when it comes right down to it, I fell in love with this movie. It’s really a blast for me, and I don’t care if anyone disagrees. If you feel strongly against it, I implore you, watch it one more time. X-Men: The Last Stand sidestepped from its usual routine, but was able to satisfy nonetheless, by having you at the edge of your seats the whole time. Honestly, I dislike this movie very much, but I love the passion in your review. This is a very nice read.